Seventh Sense presents The Best of the West End at the Royal Albert Hall on Monday 8th October at 7:30pm. The concert offers a great line up of musical theatre stars including Ruthie Henshall, Michael Xavier, Ben Forster, Lauren Samuels, John Owen-Jones and Mazz Murray with special guest Russell Watson performing the best of the West End with classic songs from shows including Les Misérables • Mamma Mia • Chicago • Phantom of the Opera • Dream Girls • Jersey Boys • Lion King • West Side Story • Joseph and the Amazing Technicolor Dreamcoat. RUTHIE HENSHALL: Olivier Award Winner with credits including: Cats, Les Misérables, Chicago, Miss Saigon, Billy Elliot, Oliver, Crazy For You, Annie, The Woman in White, Guys and Dolls. BEN FORSTER: Winner of TV and West End ‘Superstar’, who starred as The Phantom in The Phantom of the Opera. Credits include: Jesus Christ Superstar international Arena tour, Elf the Musical, The Rocky Horror Show, Evita. JOHN OWEN-JONES: Credits include: Les Misérables, The Phantom of the Opera, Merchant of Venice, Show Boat, The Sound of Music. RUSSELL WATSON: Described by the New York Times as a performer who sings like Pavarotti and entertains the audience like Sinatra. MAZZ MURRAY: We Will Rock You legend whose credits include: Mamma Mia, Fame, Rent and Smokey Joe’s Café. MICHAEL XAVIER: Olivier Award nominated actor who recently starred on Broadway as Joe Gillis in Sunset Boulevard opposite Glenn Close and went directly on to star in his second Broadway show, Prince Of Broadway. LAUREN SAMUELS: credits include Bend It Like Beckham. Leading lady in Grease and star of We Will Rock You. JACK PACK: Britain’s Got Talent finalists The UK’s most successful Swing Group. .
FRIEDERIKE KRUM: Award-winning mezzo soprano with multiple albums and show credits to her name. 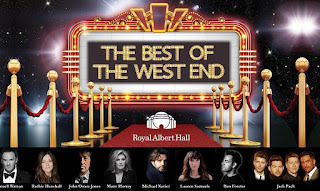 HEART OF ENGLAND PHILHARMONIC ORCHESTRA: Formed by Helen and Richard Fitzgerald in 1996 at Birmingham’s Symphony Hall, they have toured regularly with artists such as Smokey Robinson, Gloria Estefan, Barry Manilow, Chris de Burgh, IL Divo, Gladys Knight, Alfie Boe. MUSICAL THEATRE MASTERCLASS: talented and aspiring performers, aged from 10-25 who have been mentored by some of the best in the business, including Michael Xavier, who runs the academy, Sir Matthew Bourne, Kerry Ellis, Ramin Karimloo and many more.